“The food is readyyyy!” was my favorite phrase as a kid. I would drop everything I was holding and stop anything I was doing at the sound of my mother’s announcement. My siblings and I would dash to the kitchen, drooling from the smell produced from the pots and pans on the stove. Even if I had argued and fought with my siblings hours earlier, all was forgotten as soon as our bottoms touched the dining chairs. We’d eat in harmony, nodding and smiling away at each other. For some reason food caused a sense of happiness and brotherly love in us. However silly, jokes and laughter would rise at the dinner table. Joyful conversations about random things were born. We enjoyed our presence together for just a few minutes or maybe even hours. Every second owned up to its worth. 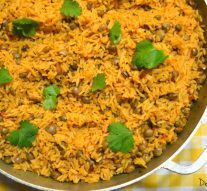 We satisfied our hunger with the arroz con gandules my mother would prepare with love for us. But we also satisfied our hunger for each other, the hunger of wanting to be close. Every time I’d ask my mother how she cooked the food, she always answered “It was made with love”. Whether the pollo was juicy and crispy in the right areas or whether it was lacking a bit of taste, we knew it was cooked with love so we enjoyed it. My father would come home exhausted from work. Nevertheless, we’d sit at the dinner table and excitedly wait for him to make himself comfortable before sitting with us to enjoy my mother’s platano maduro and habichuelas. Everyone had to have their focus and energy on the food and on each other. No one was to pull a phone out or have a newspaper or book at hand while eating together. The tv or gaming system had to be turned off when dinner was ready, and anyone playing with toys had to pick them up and join the table. There was no sitting on the living room love-seat to watch cartoons with a plate of food on our laps. Dinner time was family time and nothing could take that experience away. Sadly though, the older and busier our family got, the less time we spent at the table eating dinner together. Dinner time ceased to exist. “Dinner is ready!” became “there’s arroz y pollo on the stove!” and we’d each grab a plate at whatever time we were able and continued about our ways. Our long beautiful dinner table turned into a small plastic foldable piece of furniture at a corner in the kitchen, piled with books and papers, and one or two futile chairs. My siblings grew lazy and tired of mom’s yellow rice and frijoles; so they opted for cupped ramen noodles or canned easy meals instead. Mother stopped cooking due to the pain of hard labor and coming home to prepare a meal that would be left untouched. Father would have eaten at a Subways deli before coming home late after a day of delivering products all over Florida. As a result, family day was born on Sundays, the only day we had a little time after church. Sundays were a day to search for a restaurant to dine in and laugh again. Family days were successful for a while, but they too escalated when I got a new job. What happened to setting the table with my younger sister and I? What happened to helping mom scoop the mixed rice and ensalada de papa into a bowl to put at the center of the table, where we would all sit? What happened to the table where we’d all make jokes and laugh to the point of spitting Malta Goya through our nostrils. Luckily, it wasn’t all over. The time we lost during the year was refunded on holidays. Blessed holidays were the antidote to my family. We relied on them for the life-full conversations we missed out on. Our tummies fluttered at the melodious “happy holidays!” resonating from people’s mouths. My uncles and aunts would spend all morning, the day prior to Thanksgiving or Christmas, cooking and preparing for an immense amount of relatives. Some worked on mixing the ingredients of pasteles and empanadillas. Others took the responsibility of wrapping the mixture in plantain leaves or molding the flour of empanadillas into an edge with a fork. Another group would start to put them into boiled water or into the fryer. Those who did not participate in the making of pasteles or empanadillas took upon themselves to cook the arroz into a big enough pot for 100 people. My grandfather and a few of my stronger uncles would roast the pig for their wives to pull apart and cook it into what we know as pernil. Everyone in the family had a vital role in bringing sazones, dessert dishes such as flan and tembleque or even simply supplies for the big holiday parties. No one was left without a task. There was much to do, from decorating to cooking and inviting guests, from creating games to packing goody bags of bombones. Sometimes, planning transformed itself into chaos and generated a bit of stress, but the hard work was not in vain. Holiday parties pay off. My huge family consists of sixteen aunts and uncles and the plentiful youth of my cousins. The family continues to grow each year, my aunts seem to give birth by the second. Ironically though, we sometimes go years without seeing each other. Not everyone makes it to holiday parties but at least half of them do. We take full advantage of being able to spend the holidays with those of whom we don’t see every day. While holidays bring my big family together, the food truthfully takes the credit. We might not be able to sit at a dinner table daily, and laugh til Malta squirts out of our noses. What used to be hours of the day is now once or twice a year. That is why we will never take it for granted. Trays of delicious food align long tables at the parties. I’m talking trays of mollejas and potatoes and onions, trays of rice and beans, trays of pernil or pollo asado, trays of frijoles or platano maduro, and trays piled high with empanadillas, tostones, and pasteles. Food made with love, of course. My aunts’ and grandmothers’ best cooking skills are well represented in each plate of our traditional food. We sit at tables or on the floor; it doesn’t matter. What matters is that we eat together and make jokes, laugh and cry joyful tears, satisfy each others’ presence with a happy stomach and a happy smile plastered on our faces. Food brings us together.